It's here! 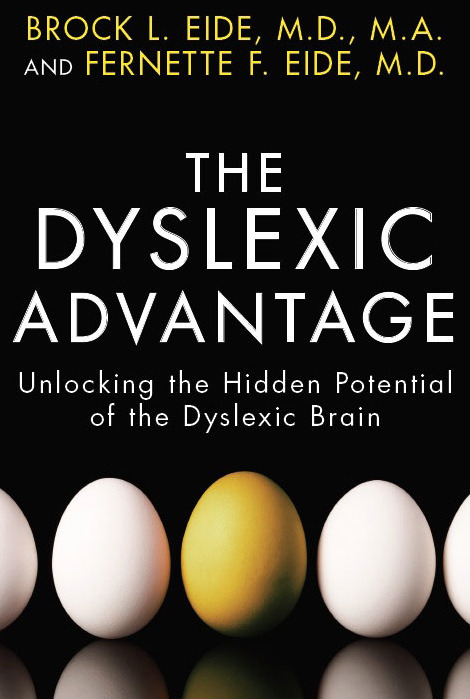 Our book, The Dyslexic Advantage is out! In Dyslexic Advantage, we weave together stories from incredibly talented people with dyslexia (writers, scientists, entrepreneurs, and more) with some of the latest neuroscience research about dyslexic processing, insight-based thinking, visualization, and scene construction. Listening more different people's experiences with dyslexia tells us much more than simplistic categories of learning disabilities. Check out this brief excerpt from our interview with James Russell, inventor of the compact disc. Us: Were you a math kid? Us: I would’ve thought that physics and electronics is rules…it’s not? Barbara Russell: In Trigonometry – you have to memorize all the trig functions – Jim found it easier to derive them each time rather than memorize them. Us: How is it visual? James Russell: If you’re talking about circuits, the electrons are going this way (gesturing), then there’s resistance (gesturing) and the storage capacitors (more gesturing) and the Philip capacitors. Us: So a lot of movement, right? Eides: Now there was a story about Tesla where he had said if he were building a machine, he could imagine it in his mind so clearly that he could manipulate it and tweak it to see what would happen. He said he could perform experiments in his mind. Do you have something like that? Eides: How detailed are the visual images. Can you see them like pictures or do you have a sense of relationship and their kinetic properties. Are they color images? James Russell: That’s a tough one to answer. That depends on what level. If we’re talking about building something like a chair, then it’s all detail visual. I’ve got a 2 by 4 and put another 2 by 4. I’ll nail it this way and so forth. If it’s something more technical, then there are still images, but they aren’t exact images. It's an image type-thought. It's not a specific image. It's interviews like that that should make us pause to ask how much we really know when we say we understand dyslexia or different thinking or problem solving styles for that matter. James Russell was by his own admission an "average" student in school, but there were definite glimmers of his ingenuity and talent at a very young age. We hope that The Dyslexic Advantage is just the tip of the iceberg when it comes to an understanding of the breadth and depth of dyslexic gifts and talents. Dyslexia is thought to be as common as 1 in 10 people - if that is so, that's a lot of diamonds in our midst.